If this card is sent to the Graveyard, and you have no Spell/Trap Cards in your Graveyard: You can look at 5 cards from the top of your Deck, then place them on the top of the Deck in any order. 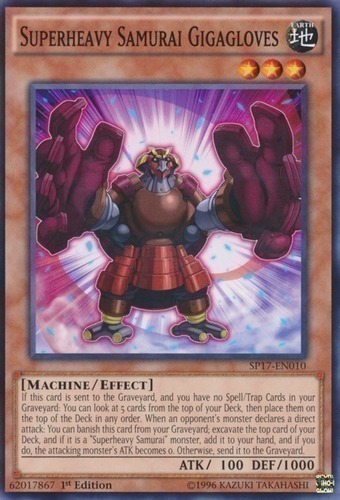 When an opponent's monster declares a direct attack: You can banish this card from your Graveyard; excavate the top card of your Deck, and if it is a "Superheavy Samurai" monster, add it to your hand, and if you do, the attacking monster's ATK becomes 0. Otherwise, send it to the Graveyard.